Madurai is a land of culture and customs. This ancient city is full of life and never sleeps, hence why it’s known as the Sleepless city. Even in this modern era, Madurai and its people cling on to traditional customs and grow along with it. Meenakshi Amman Temple is the identity of Madurai and apart from that, this sleepless city is known for Jasmine flower, Jigarthanda and palatial street foods. The town was officially inaugurated in 1968. Auroville Ashram is considered as the “Universal town” and the city is perfectly planned in a circle of radius 1.25 kms. There are many notable tourists destinations at Madurai, Mahatma Gandhi memorial is one among it. Mahatma Gandhiji and Madurai share a very unique bond between them. It is said that Gandhiji changed his dress code only after coming to Madurai and remained the same until he died. A museum was constructed in Madurai in his remembrance after his death. 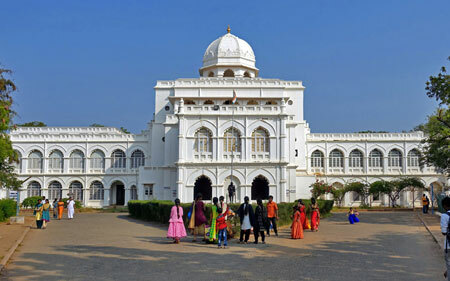 The place where the museum stands today was a palace of Rani Mangammal of Nayaka dynasty. There is a picture gallery where different pictures of Gandhiji are kept on display. There is also a ‘Hall of Relics’ where different things that originally belonged to Gandhiji are kept on display. There is also a hug open hall theater which can accommodate upto 8000 people. The admission is free and you can visit from 10.00 a.m. to 1.00 p.m. and again 2.00 p.m. to 5.30 p.m.